Modern, comfortable family home (approx. 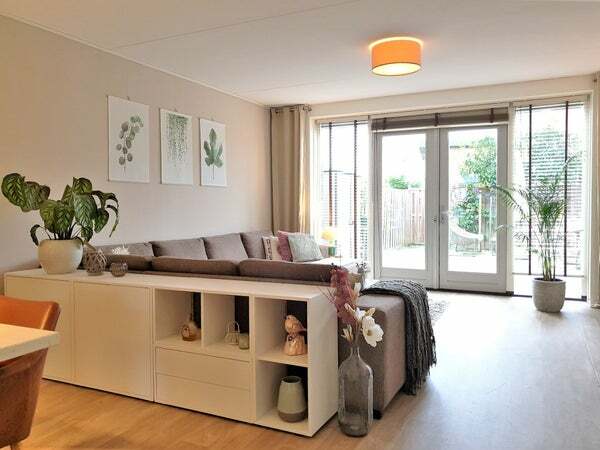 120 m2) with a south-facing garden located in Dorpshaven-Zuid. - 3 bedrooms; master bedroom at the front and with double bed and enough wardrobe space, the second bedroom is located at the back has a double bed as well along with a small couch. The third bedroom is now used as an office and has a desk with chair. - laundry room with washing machine. Dorpshaven-Zuid is a water-rich, young residential area within walking distance of the center of Aalsmeer. In the center you will find various restaurants, the main shopping street with various supermarkets, bakers, butchers and other shops for daily shopping. You will also find sports facilities in the area. The house is easily accessible by public transport and roads are in the vicinity. Rental price: € 1,750 excluding utilities, TV / internet and municipal taxes.